Cyprus has announced a major gas find which could help boost the country's struggling economy. President Dimitris Christofias said exploratory drilling had revealed a field containing between 5 and 8 trillion cubic feet of natural gas under the Mediterranean Sea. US firm, Noble energy, has been drilling at the field which is next to a larger Israeli discovery. The find may provoke tension with Turkey, which opposes any drilling. If exploited, the field could make Cyprus self-sufficient in energy for decades, or allow sizeable exports to Europe. The gas field is located 115 miles south of the island. "The discovery of natural gas in the exclusive economic zone of our country opens great potential for Cyprus and its people, which with prudence and in a spirit of collectiveness we will utilise in the service of public interest," said President Christofias. The country has struggled economically during the eurozone debt crisis and growth for 2012 is forecast at just 0.2%. 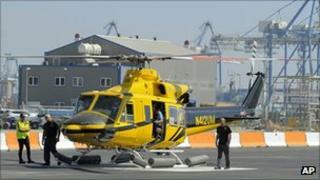 Turkey says Cyprus has no legal right to search for oil and gas and has sent its own survey ships to the field. The island was split in a Turkish invasion in 1974 after a brief Greek-inspired coup, and Ankara supports a breakaway state in northern Cyprus.